Regular readers of books by Hancock and Bauval should note straightaway: 'The Master Game' is an updated version of the 2004 book 'Talisman'. I haven't read 'Talisman', although I did once attend a lecture by Robert Bauval where he discussed the content of that work. 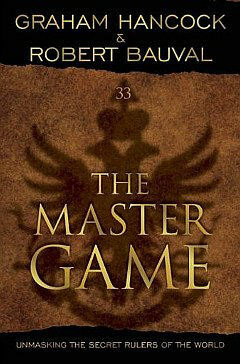 I enjoyed 'The Master Game' immensely, but others expecting a brand new work will be disappointed. I'm going to offer an in-depth review of the 2011 version here, and then add some material gleaned from the book that is pertinent to Dark Star readers. This work is a chronicle of religious conflict in Christendom. France is the main focus of attention, but this 636 page opus extends well beyond Gallic shores to the rest of the European continent, the Middle East and North America. Although the conclusion of the books seems to indicate an age-old conspiracy at the root of the religious wars of the last 2000 years, the text is packed full of historical analysis which skirts along the edge of academic study. With a historian's vigour, the authors have pooled together a wealth of knowledge to make this something of a blockbuster. As one reads one wonders why they are presenting just so much supporting material. Towards the end of the book, the reason becomes apparent. In the post 9/11 West, bringing up the concept of Crusades was highly contentious, and the authors needed to sound serious. In the heady days of 2004, the alleged connection between Freemasonic influence in Western governance and the War on Terror may have had some traction outside Islamist sects. But the post-Arab Spring period of 2011 has exposed the pragmatism of Western foreign policy towards Middle Eastern governments of all persuasions. Change has come from the people, not the ruling classes. And where 'The Master Game' shows how previous revolutions have pivoted around Hermetic, Masonic, heretical symbols when confronting tyranny, the Arab Spring presents us with no contemporary allusion. One senses, then, that the true cry of Revolutionaries everywhere is more "Get the Bastards!" than a chorus of 'Jerusalem'. So, to 18th Century France where the old Monarchist order is swept aside (twice), leaving a vacuum of ideas (so important to French life). The French were heartily sick of the Catholic Church and, for a while at least, embraced the goddess Isis and the seeding of Egyptian icons into their Capital's Grand Plan. To cap it all, Napoleon takes the not inconsiderable French forces across the Mediterranean to invade Egypt, reflecting the adventures of Alexander the Great and Rome before him. Post-revolution Paris is re-designed as an 'ideal' city, influenced greatly by the rise and rise of Freemasonry during that historical period. The Cathars were the religious element of a flowering renaissance in southern France at that time, and the growing sense of freedom to think and live outside the confines of Catholic doctrine was more of a danger to the established orthodoxy than even Islam. In an 'internal' Crusade, the Cathars were brutally persecuted by the Church, amounting in modern terms to genocide. The Cathar religion is important, the authors point out, because their philosophy was Dualist. It was by no means an isolated case of heresy. Other Dualist doctrines had faced similar treatment down the centuries, from the Gnostic Christians, through the Manicheans, to the Bogomils of Bulgaria and the Cathars of Occitania. The authors consider it likely that there was a hidden, unbroken chain of Dualist heretical thought that periodically surfaced throughout Europe only to be systematically persecuted by the Catholic Church. Even early on in the book one senses that the Freemasons are to be billed as the contemporary holders of this heretical baton. Between the Cathars and the Rosicrucians/Freemasons are the ill-fated Templars. These mediaeval Crusaders/bankers failed to take arms up against the Cathars during the Albigensian Crusade, and the authors contend that the were also minded to be heretics - indeed as they were accused of being by the Church. Surprisingly, perhaps, the grip of the Church is eventually loosened by the reappearance of the Hermetic texts in Europe. The 3rd century Asclepius seems particularly influential, with its prediction of 'restoration, reformation and restitution' in the form of a future great city. Great thinkers of the time, like Bruno and Campanella, took to the idea of creating a 'City of the Sun', influenced perhaps by the revolutionary Heliocentric theories of Copernicus. Bruno was slowly burned at the stake for his impudence, and Campanella's horrific treatment at the hands of the Neopolitan Inquisition was just as bad, even though he somehow survived to become something of a celebrity. His remarkable survival seems to set the tone for the emergence of the Enlightenment. The book describes the fate of heretics in vivid, horror-filled detail, portraying the very human struggle necessary to overcome tyranny and evil. Which brings us to the anti-monarchist revolutions in England and France, and the War on Independence in America. The authors continue their thread through these historical events. Freemasons abound among the revolutionaries in France and America (and among some of their enemies, too, it should be noted), with the result that finally the heretics get to wield some real political power. The result is particularly notable in post-revolutionary France where the new Republicans force a religious change upon the Catholics of the country, to one based upon ancient Egyptian symbols and deities. Eventually, France becomes secular (achieving true Enlightenment, in my own opinion) and America occupies more complex ground. But for a while, at least, both countries seemed to embrace the Deism of the Freemasons. The national monuments and civic centres were designed to reflect their quasi-Judaic belief system: city plans set out like the Sephiroth of the Caballa (reflecting the first 32 degrees of the Scottish Rite so important to American Freemasonry), as well as the incorporation of Templar-inspired octagonal spaces. Bauval sees more: the main axes through central Paris are aligned in a similar fashion to the temple of Karnac in Thebes/Luxor. Modern monuments raised in late 20th Century Paris continue the trend, leading one to conclude that the Masonic influences of the past are just as active now. Which leads us to the final conclusions of the book: If the leaders of the West still build monuments showing Masonic influences, then are their foreign policies similarly influenced by the religious struggles of the past? Certainly, the Islamists claim that the US are Crusaders, supporting modern-day Israel. But is such a notion also shared by Western leaders? Through their presentation of some understandably emotive post-9/11 quotes, the authors indicate that such a dark notion may have some substance. The long, hard road to secularism has dampened the need for a continuation of these same factional, religious conflicts within modern society - thankfully. Where 'The Master Game'/'Talisman' is most powerful is in highlighting just how important these heretical struggles were historically. Even if this is simply an updated version of 'Talisman', seemingly timed to come out during the 10th anniversary of 9/11, this is still a great book. Too many typos and malapropisms for a book of this stature, it's true; and over-long with the minutiae of historical detail for sure. But a triumph of research and learning, bringing the reader a view of history that is hidden in the open for all to see. Subtitled "Unmasking the Secret Rulers of the World"